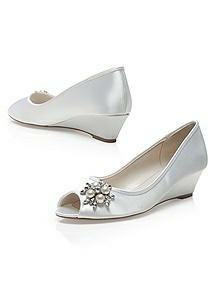 Dessy's dyeable satin bridal wedge is perfect for the bride or her bridesmaids. 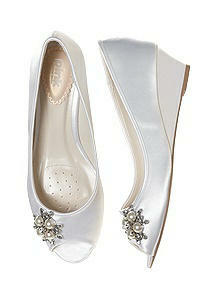 This gorgeous shoe is trimmed with a sparkling rhinestone and pearl jewel. The 1 3/4" wedge heel will keep you comfortable through out your special day. Imported.